The dark sky community has lost a long-time friend and enthusiastic supporter of the International Dark-Sky Association (IDA). Bob Gent, retired United States Air Force Lieutenant Colonel, former space systems officer, astronomy enthusiast, and former IDA President passed away on March 23, 2019. Bob’s influence on IDA’s success over the years cannot be overstated. Bob joined IDA in 1996. He served on the Board of Directors from 2002 to 2008, holding offices of Vice President and President. Under his leadership, IDA launched the Fixture Seal of Approval program, designated Natural Bridges National Monument as the first International Dark Sky Place, and championed the establishment of local sections–now known as IDA chapters. Bob stepped down from his role as President in 2008 and continued to support IDA as a volunteer throughout his life. Bob became familiar with IDA’s mission when he met IDA co-founder Tim Hunter at a meeting of the Astronomical League in San Antonio, Texas in 1995. He was stationed in Tucson, Arizona a year later and began working at IDA as a volunteer. 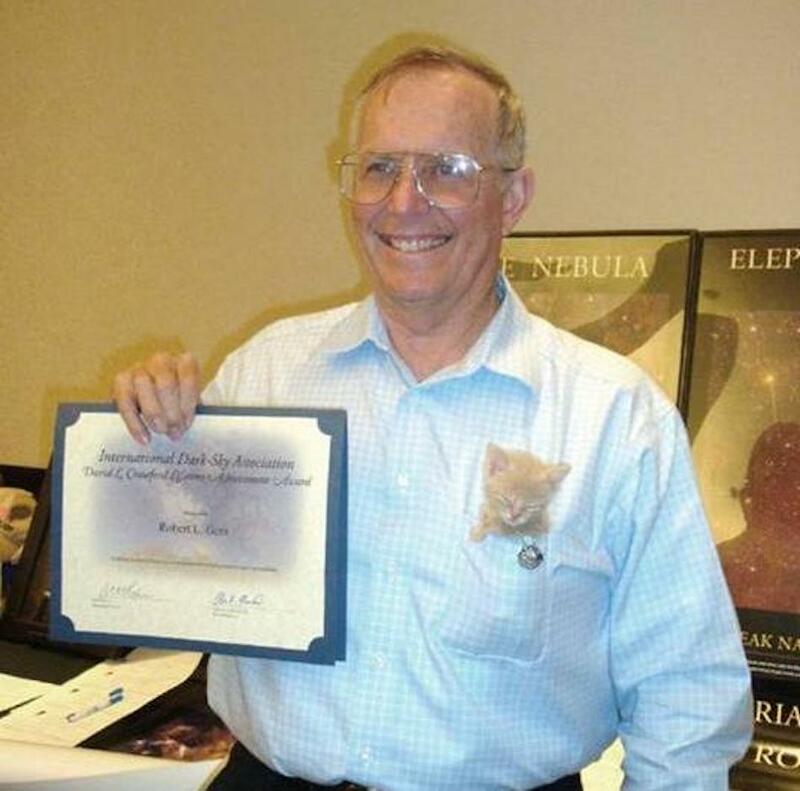 Tim told us, “bringing Bob into the organization is the best thing I ever did for IDA.” Bob traveled frequently for the Air Force and made contact with astronomy and light pollution advocates all over the world. He was instrumental in IDA’s international reach. He was active in European Amateur Astronomer groups and served as the “go-to” for IDA’s engagement in communities in the U.S. and abroad. “Most European IDA members were originally recruited by Bob,” Hunter said. Bob was instrumental in connecting IDA with Arizona Representative Gabrielle Giffords to advance efforts for IDA to brief the House and Senate members of the U.S. Congress on light pollution. A June 2008 briefing to the House Committee on Science & Technology (now the Committee on Science, Space & Technology) resulted in a bipartisan congressional letter to the Environmental Protection Agency (view the letter here) and a follow-up briefing to the Senate Health, Education, Labor & Pensions Committee. Bob’s most recent accomplishment is the establishment of the IDA Ohio Chapter. Late in 2017, Bob and his wife Terrie relocated from Arizona to Ohio. Bob immediately began reaching out to IDA members to generate interest in the creation of a state-wide chapter to work toward IDA’s mission. Within months, the IDA Ohio Chapter was holding education and outreach events across the state, working with the Ohio Parks and Recreation Association to encourage parks to strive for better lighting, and supporting the application of Ohio’s first Urban Night Sky Place. Bob personally led a project with Mills Lab, the American-owned and operated designer and manufacturer of energy-efficient LED lighting solutions, to enhance their designs for night-sky friendly lighting. Bob’s fierce commitment to IDA’s mission was coupled with a gentle manner that easily disarmed critics. His advice to other supporters was, “make friends, not enemies.” It is a mantra that has echoed through the organization and bolstered efforts to protect night skies around the world. With Bob’s advice and guidance, countless advocates have built relationships with policymakers, lighting engineers, and others to show them the win-win proposition of environmentally friendly lighting and efforts to protect the natural nighttime environment. Tonight, when you look up at the stars, spend a moment to remember Bob Gent for his long and passionate service in preserving our access to the night sky.